Efficiency and productivity are at the forefront of better warehouse management and meeting the needs and expectations of the demanding customer. With the recent launch of total wearable solutions from Zebra Technology, the workflow in warehouses is expected to change for the better. 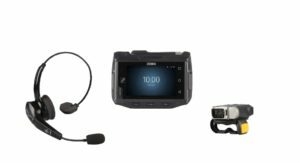 According to Zebra, a Nova Communications partner, production in warehouses can increase as much as 13 per cent, with 39 per cent less errors as a result of warehouse mobile wireless technology and wearable solutions. With increased productivity and decreased errors, there are top and bottom line benefits in warehouse environments, and customers benefit as well. What Is a Wearable Mobile Computer? It’s quite simple, really, and it’s exactly as it sounds. Instead of your employees walking around carrying scanning devices or mobile computers, they are taking it to the next level with wearable solutions that allow your employees to complete their tasks with both hands. Options include wearable computers, ring scanners, headsets and wearable terminals. With these devices, data capture capabilities are happening closer to the user – through voice, gesture and touch – therefore workflow is increased at the end of the day. The goal with wearable mobile computing solutions is to transform the workflow of warehouse workers. By giving your workers the ability to work efficiently, there is better accuracy and less delays. A benefit of this solution is completing tasks in less time than when mobility was limited from having to hold devices. According to Zebra, the number of warehouses are growing and there’s an increase in expansion of existing facilities, so with an adoption of wearables, those warehouses are going to run with increasing efficiency. For the warehouse employee, it is optimal to have hands-free capabilities throughout the workday. Imagine moving, picking, placing and sorting with one hand – it’s not ideal for anyone. An added benefit of warehouse wearable solutions is the products are built with ergonomics in mind – forget the heavy and uncomfortable solutions for your workers. A ‘human factors’ team has worked with the design of these products to ensure they are okay to be worn throughout the day – and comfortably for your workers. The result? Reduced fatigue and better productivity at the end of the day. Zebra Technology stands out for a number of reasons in the mobile computing and wireless technology field. First of all, they are the only dedicated device built on Android and further backed by Mobility DNA, a Zebra engineered technology that enables mobile computers to have the amazing enterprise capabilities it’s known for – increasing both scan performance, up-time and manageability. Companies are looking for an integrated platform which will help increase workforce productivity, and reduce downtime. With the face of warehouse solutions changing, and the demand of logistics increasing, Zebra has made the switch to enable you, the warehouse employee, to continue to meet consumer demands. Today’s warehouse is a fast-paced operation – customers want to know they can place an order in person or online and get what they’re looking for immediately. As such, warehouse solutions like the wearable mobile computers are the answer. Want to learn more about the devices and how they could work for you and your team? That’s what Nova is here for. Contact us today for more information. And remember – we put wireless to work!